These strikes came shortly after Obama met his advisers, including General David Patraeus right after the general's return from a visit to Pakistan. It's the clearest indication yet that Obama will continue the Bush policies in Afghanistan and Pakistan at least in the immediate future. It also indicates that Pakistani leadership is willing to tolerate these attacks, in spite of strong Pakistani public opinion against it. 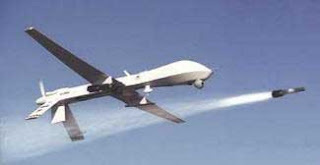 There were thirty reported US drone attacks in Pakistan in 2008. Given the inauspicious start of the Obama presidency with two strikes in two days, it is likely that the number of attacks will continue to grow and severely test the patience of Pakistani leadership and its people. The ferocity of the Taliban fighters has already stretched the Afghan war into its eighth year, making it the second longest war in the American history. With the US decision to send another 30,000 soldiers to Afghanistan, it seems more and more likely that the Obama presidency will be defined by the Afghan war in the same way that the LBJ presidency was defined by America's deepening involvement in the Vietnam war engulfing the entire Indochina region. In some ways, the Obama challenge is much more difficult because of the dire economic situation that America is facing today. Naturally, there is focus on a more cost-effective approach with fewer American casualties in the US military to fight and win the Afghan war. Obama's interest in high technology extends beyond his Blackberry and his use of online social networking. In addition to more US and NATO troops, Obama likes the fact that the US has reportedly built as many as 5000 predator drones and other robots that can be increasingly used in the Afghanistan-Pakistan theater. The US Army is also actively recruiting more video-game-savvy drone pilots and robot operators, some of them in their late teens and early twenties for this high-tech warfare. The recently opened Army Experience Center in Philadelphia is a fitting counterpart to the retail experience: 14,500 square feet of mostly shoot-’em-up video games and three full-scale simulators, including an AH-64 Apache Longbow helicopter, an armed Humvee and a Black Hawk copter with M4 carbine assault rifles. For those who want to take the experience deeper, the center has 22 recruiters, according to a report in the New York Times. In his latest book titled "Wired for War", author P.W. Singer talks about a 19-year-old high-school dropout who is considered one of the best predator pilots in the US Army. This pilot was reportedly a champion video-gamer before being recruited. It is amazing that this young man is considered better as a drone pilot than the much better educated and battle-hardened US Air Force pilots. He has now been elevated to an instructor. High-tech or low-tech, all indications are that the US war in Afghanistan and Pakistan will escalate and intensify into a regional war under President Obama. I hear the echoes of Indo-China in the words and actions of Obama in Afghanistan and Pakistan. Pakistan needs to answer one question: Does it have any authority over ares in its borders? If yes, then take out Talibans. If no, then stay back/aside and let others take care of Talibans. There is no 3rd way, no matter how much u like the drone strikes or Talibans. Taliban are a grassroots movement with popular support on both sides of the Pak-Afghan border. Their popularity has only grown as a result of US and Pakistani actions, and the total incompetence and well-publicized corruption of the Karzai government. There is now consensus developing in the US, Europe and Pakistan that they can not be militarily defeated. The predator strikes and more ground troops are not likely to have the desired results. On the contrary, these actions further inflame the situation for both Americans and Pakistanis. The real solution to Afghanistan has to be political, not military. ..do they make Pakistan safer? The markets of Lahore were thronged with people in the days before Eid al-Adha last month, with families buying clothes for the children and knickknacks for their homes. In Islamabad, there are new cafés and boutiques in every neighbourhood; red-velvet cupcakes are trendy. Two years ago, when the Taliban were sending suicide bombers into crowded public places in these cities every week or two, the markets and the coffee shops were deserted and people were afraid even to go to mosques. That terror campaign has been checked – either because the Taliban have changed tactics or, as many analysts here suggest, because the intensified drone campaign has weakened them. Lieutenant-General Talat Masood, who is retired from a top position in the army, has a kinder interpretation. In an interview in his cozy Islamabad living room, he says it is simply unrealistic to think that the Pakistani military, equipped as it is, can fight a fleet-footed insurgency in some of the world’s harshest terrain. Given that, the drones do not look so bad: That is the politically incorrect sentiment one hears in private conversations across the political and socio-economic spectrum, in marked contrast to the anti-drone arguments that fill the editorial pages. Drones are also, some argue, preferable to having the United States deploy soldiers in Pakistan – which the U.S. government would be unlikely to do in any case. Drones are also better than risking the lives of even more Pakistani soldiers to the near-constant Taliban attacks in the tribal areas, this argument runs. “A lot of high-profile targets are eliminated, and who would do this job if Americans boots are not on the ground and the Pakistan army won’t?” says Arif Nizami, editor-in-chief of the daily Pakistan Today. “Drones are a very hard choice for a pacifist to make,” says Pervez Hoodbhoy, a nuclear scientist turned peace activist who is the best-known advocate for non-violence in Pakistan. Is it better to kill Islamists than to have them killing people? That’s the debate, he says, burying his face in his hands at the thought of the moral quandary his country faces. Many Pakistanis believe the military actively feeds the drone program intelligence about insurgent activity even today, because it, too, perceives the campaign as more effective than other options, Mr. Nizami says. The army spokesman’s office declined repeated requests for an interview. The last person who would ever give up the fight against drones is an erudite lawyer named Shahzad Akbar, who runs an organization called the Foundation for Fundamental Rights in a leafy neighbourhood in the capital, where he works to make heard the voices of victims from the tribal areas. While he understands that the killings may make someone sitting in Islamabad feel safer, he says, he finds it ethically abhorrent to conclude that drones are a boon to the country. He also noted that the drone campaign has been under way since 2004, with no overall decline in attacks. Yet Mr. Nizami says he believes that there is considerable support for the drones in many parts of the Taliban-plagued northern region of Khyber Pakthunkwha. The timing of the strike was noteworthy: it was the day after CIA contractor Raymond Davis, who had shot two Pakistani men, was released from a Lahore jail. The fact that Davis had been detained for weeks reportedly angered the CIA. “It was in retaliation for Davis,” a former aide to Munter told the Associated Press, referring to the strike. (The CIA did not respond to my request for comment.) In the end, the strike killed at least 10 militants, and reportedly 19 or more civilians. And Munter wasn’t the only one who was upset. So were the Pakistanis: Gen. Ashfaq Parvez Kayani, the Army chief, said the men had been “callously targeted.” Rumors circulated that some of them were spies for the military, risking their lives to help fight the Taliban. WASHINGTON: Former US ambassador to Islamabad Cameron Munter on Wednesday criticised Washington’s “callousness” over the killing of Pakistani troops as he called for both nations to rethink how they see each other.